Eliminate bag sag with the Belle Bag Designs base shaper. Simply place bag base shaper in the bottom of your LV Neverfull MM and watch your handbag go from saggy to spectacular. This bag base shaper is two layers of man made felt, double stitched for durability, with thin acrylic in between. It has an elegant look and is guaranteed to fit. This attractive base shaper will protect the bottom of your expensive designer bag, and it will enhance the look of your bag both inside and out. Measures approx. 12" L X 5 3/4" W Please note that any bags shown are not included - you're just purchasing the base shaper. All base shapers are use at your own risk. We are not responsible for excessive wear or color bleed over time caused by the use of this product. Liability for damages is limited to the cost of the base shaper. ELIMINATES BAG SAGGING, MAKES YOUR LV NEVERFULL MM LOOK STRUCTURED AND GORGEOUS - Give your handbag the gorgeous and structured look you want without any sagging or drooping. Display your LV handbag with the confidence, style, and shape you know it deserves. PROTECTS YOUR EXPENSIVE HANDBAG FROM SPILLS AND DAMAGE - Protect your investment and keep the bottom of your purse clear of makeup spills, ink blotches, and leaky liquids. Your LV handbag is a pricey investment, this shaper insert keeps the bottom of your purse tidy with an extra layer of protection. PUTS AN END TO BULGING OR DROOPING IN THE MIDDLE OF YOUR PURSE - Get the bag structure you need without adding additional weight. Use with your favorite purse accessories or handbag organizers to create the perfect organized purse that looks like a million dollars. 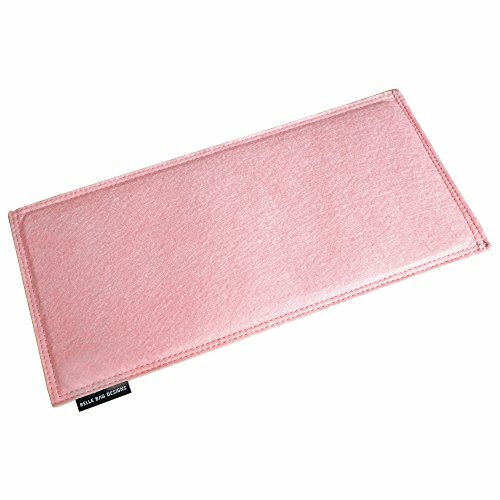 GENTLE ON YOUR BAG WITH MAN MADE FELT AND ROUNDED CORNERS - Rounded corners and double stitched man made felt provide ultimate structure for your handbag tote to avoid handbag wear and tear. GUARANTEED TO FIT YOUR LV NEVERFULL MM AND ELIMINATE BAG SAGGING OR YOUR MONEY BACK - This base shaper comes with a manufacturer LIFETIME WARRANTY. If it doesn't fit your LV Neverfull MM or doesn't reduce bag sagging like you thought it would, you can contact us for a full refund GUARANTEED. If you have any questions about this product by Belle Bag Designs, contact us by completing and submitting the form below. If you are looking for a specif part number, please include it with your message.